If you are looking for what's on for kids in Johannesburg over the Christmas holiday, then check out our daily activity (Wednesdays to Sundays from Saturday 6th December) on growing vegetables in garden soil that is full of goodness - see our events calendar for more details. While the kids are busy, why not browse around our beautiful indigenous nursery for plants to buy, relax with a great coffee in the outdoor tea garden, or pick out special Christmas gifts from our shop. 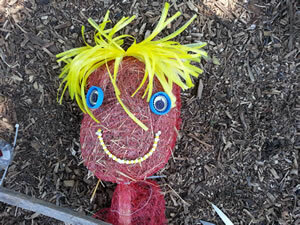 During preparation of the Sustainable Food Garden, we enjoyed making a Scarecrow for the vegetable patch so much, that I thought it would be good to share with you just how easy it is. Apart from keeping pesky birds from eating your crops, it adds a lovely farm feel to the vegetable garden. 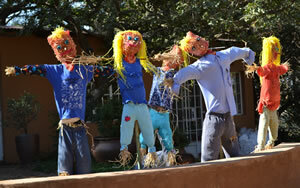 To make a garden scarecrow is a great outdoor holiday activity for kids, whether teenagers or little ones. They learn so much too, without realising it - planning skills, fine motor co-ordination, measurement, and loads of tactile stimulation with all the different textures of materials. For younger kids, you will probably find that you need to lend a helping hand. Orange bag for the head. Straw or long dead grass for stuffing. 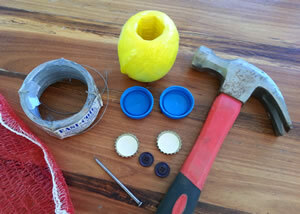 Punch a hole through the plastic bottle tops and the beer bottle tops with a hammer and nail. Then bend a small strand (about 10cm long) of wire in half. 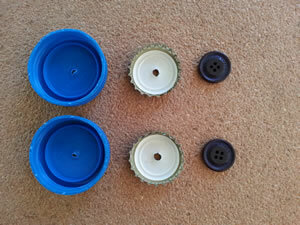 Thread one piece through one button hole, and the other through a second button hole. 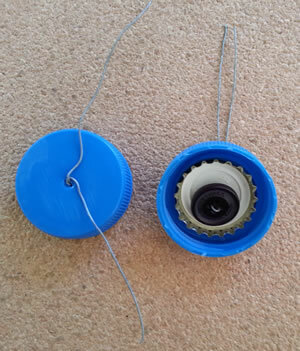 Then thread both pieces through the beer bottle top and through the plastic bottle top as illustrated. Bend both ends of wire out to make it easier to twist them around each other to secure all the pieces of the eye. Attach the eyes to the orange bag before filling it, as this is much easier than when it is full of grass! 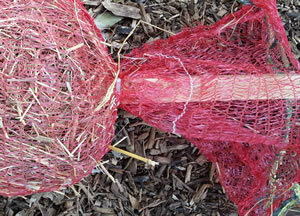 Fill the head with straw or grass, taking care to pull out any big stalks that will distort the shape of the head. Once you are happy with the shape, you are ready to put it onto its supporting pole (stick). Push the stick into the head at least about 10cm. The further the stick goes into the grass of the head, the more secure the head will be. Adjust the grass around the stick and push and pull the head until it is sitting how you want it to. 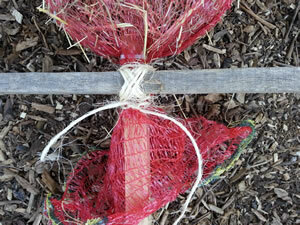 Then thread a cable tie through the orange bag as illustrated and pull it tight around the stick to secure the head. The remaining “skirt” of orange bag will be tucked into the shirt of the scarecrow. 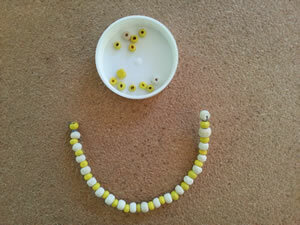 You can use just about anything you have, from ribbon or wool to beads threaded onto wire (which is what I did). 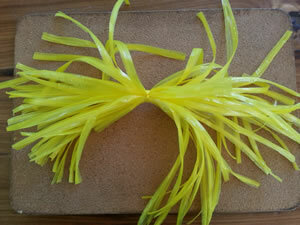 If you use ribbon or wool then this can just be threaded onto the head of the scarecrow where the mouth should be. For beads on a wire, use tiny cable ties to secure it onto the Scarecrow’s face. For the hair, I used some plastic ribbon I had in my haberdashery box, and just cut it and tied it in the middle as shown. You can use strips of a plastic bag that has been cut up, or fabric, wool, ribbon or even a broken pompom from your cheerleading days. Arrange the hair on the head as you want it and then cable tie or just tie it on with string. Tie the smaller stick onto the vertical support stick. If you are going to use a shirt or sweater with no arms, then you will need to put this onto the arms-stick before you tie it to the supporting stick. 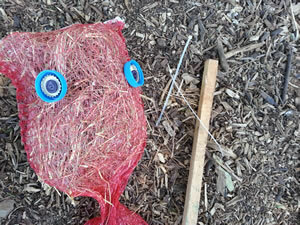 All self-respecting Scarecrows need a nice plump tummy – so hook the plastic bag handles over the arm-stick on either side and fill it with as much grass as you can. If the handles of the bag are too long you could always tie a knot in them to raise the stomach area. If you don’t want a scarf on your Scarecrow, you can even have some of the grass spilling out of the neck of the shirt you use. If you have a Button up shirt, put it on the “arms” now, so that you can see how far up the arms you need to attach the hands. 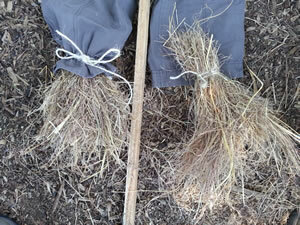 The longer the grass / straw is, the easier it is to make nice, sturdy hands (and feet) for your scarecrow. Surround the arm wood with a good amount of grass, at a point where the sleeve of the shirt can cover the binding site. Then, with a piece of twine or string, bind the grass very firmly to the wood. If the grass is too long you can always trim it later. Do the same for the other hand. I have found that cable ties work to bind the hands onto the wood, but not as well as twine or string. To attach the legs to the scarecrow, you need to make a hole just big enough for the wooden support stick to get through. Push the stick through this hole and bring the pan ts up to where the shirt can comfortably cover their waist. Before you start stuffing the pants full of grass / straw, you will need to put the feet on. This way all the stuffing won’t just fall out the legs of the pants. Put together a nice big handful of longer, firm grass or straw, much like a grass broom but smaller. Bind this together at one end and then insert this end into the bottom of the pants leg. Bind the pants leg around the foot so that it closes the bottom of the pants. Do the same for the other foot and now you can fill the pants with grass. You could even make a slit in the knee to have some of the grass spilling out here. The pants won’t stay up on their own so secure them to the support stick by making a notch in the stick at the desired point, and then cable tying the pants to this point. If your pants do not have belt-holders then make little holes in the top of the pants to pass the cable tie through. These pants had a draw string which made it easier to close the top of them. You don’t have to close the top, but restricting it a bit does help to keep straw from falling out. Now you can add a hat and scarf too if you want to. The hat needs to be secured onto the head, as it could get blown off easily in strong wind. Any items you want to add can be added now – sunglasses, nose, basket on the arm – whatever you want! Your scarecrow is now ready to be “planted” in your vegetable patch. Don't forget that your vegetables will grow even better in good, fertile soil. We sell our own organic compost and supply a range of excellent organic fertilisers. 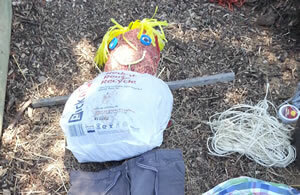 I have included some pics of lovely scarecrows made by children at a Random Harvest Event a couple of years back. We had super fun making vegetable soup and planting vegetable seedlings as well. Good garden design doesn't stop when you plant vegetables. Have a look at our display for great ideas for landscaping to design a vegetable garden that is functional and beautiful. Beautiful vegetable container gardening is increasingly popular, as we move towards sustainability in ever decreasing spaces. Always use good soil. Include plenty of organic fertilizer and compost. No matter whether vegetable gardening in containers, open ground or raised vegetable garden beds, this is the basis of healthy plants. Get good advice on what plants to buy. Most vegetables are seasonal and some grow better together than others. For example, leeks and carrots or celery will do well near each other, but avoid planting leeks next to any legumes (beans and peas). Don't use pesticides. Rather rely on organic remedies or companion planting to keep pests to a minimum. Keep your garden as life sustaining as possible in every way. « Where is the best place to plant a succulent garden?